The word “Taeguek” comprises two Chinese characters: “Tae” meaning ‘joyfullness’ and “Geuk” meaning ‘eternity’. Taegeuk is the philosophical idea from which our views on life and the universe are derived. It has no form, no beginning, no ending. Nevertheless, everything is embodied in, and has for its origin, Taegeuk. Being the first pattern, its actions are associated with the first of the eight Palgue which is called “keon”. Keon is the creative force which inhabits all physical forms. Keon is powerful and aggressive, and it is represented by heaven and light. Il Jang applies the principles of Keon to its form. The heavens give us rain, and light makes all things grow. Therefore, keon is the beginning of everything on Earth and the source of its creation. Accordingly, these pattern sets begin with keon, namely “the heavens”. As a student, you are urged to consider this concept as you perform this first form, and allow it to influence the styling of your movements. Applies the principle of “Tae”, meaning ‘joyfullness‘. Tae is manifest through a clear and relaxed mind, full of positive thoughts. This is a state in which one’s mind is kept firm and appears gentle so that smile and virtue prevail. Accordingly, the actions of this poomse should be performed gently but forcefully. Tae is a spiritually uplifting nature, but is not aggressive. It is serene and gentle instead. In compliance with these characteristics then, the actions of this form should be performed with ease and fluidity; without the sense of struggling against your limitations, but nevertheless, living fully within them. Concerns actions applying the principle of “Ri“, meaning ‘fire’ or the ‘Sun‘. It is expressed through enthusiasm in practice. A burning fire brings men light, warmth, enthusiasm, and hope. The movements of this form must emulate the qualities of fire — that of a flickering energy, of unpredictable pace and styling, and of quiet followed by great excitement and passion — but continually moving, burning. The sam jang’s actions, accordingly, should be performed with variety and passion. Actions of hands, feet, and body are successively used in defense. These actions help us attain briskness when we execute attacks. The movements associated with this form demand a variety of quickness and strength. Sah Jang is a series of actions applying the principle of “Jin”. Jin symbolizes ‘thunder‘ (noise without substance), and is expressed as bravery and steadfastness. Thunder and lightning are objects of fear and trembling. This principle suggests that we should act calmly and bravely even in the face of danger and fear. Because Tae Kwon Do is comprised exclusively of virtuous actions, these patterns express fear and trembling in the only way that virtue allows — stoically, as a passing thunderstorm which nourishes the soul. Virtue, therefore, defines fear as courage. This form, as a consequence, contains many postures that display composure and strong balance such as blocks in combination with strikes, and front kicks that require the performer to kick with force but immediately recover into a back stance. Oh Jang is a series of actions applying the “Seon” principle of Palgue. Seon symbolises ‘wind‘ (substance without noise). Wind changes directions and force without warning. Therefore, the principle of the pattern is one of contrasts; the gentle movements contrasting the violent. Seon encompasses the characteristics of wind: gentle and strong; yielding and penetrating; soothing and destructive; invisible, yet manifesting. The concept of seon is of a subtle nature, but pure, without evil intent; it is a state of being, the state of being like wind. While there are such violent winds as typhoons, hurricanes and tornados, the nature of wind is gentle. Seon symbolizes the humble state of mind. It expresses repetitive good-natured actions. Actions proceed sometimes gently and monotonously as breeze, but sometimes as forcefully as storms. These differing manifestations of one essence must be balanced throughout the actions of this poomse. This pattern applies the principle of “Gam“, or ‘water‘. Water is liquid and formless. Water never loses its nature. It flows around and absorbs all things. The stone dropped into the lake sinks through it without resistance, leaving the water untroubled. It always flows downward. This principle teaches the lesson that we can overcome difficulties and hardship if we go forward with self-confidence. No matter what troubles we face or encounter in life, there exists no doubt of overcoming them as long as we retain the qualities of acceptance, flow, and natural integrity. This set of movements must be performed with fluidity, and the feeling that every action is exactly what is called for to overcome the situation at each particular instant. Actions of this pattern resemble the nature of water, such as the passing over of disconnection through kicking. Chil Jang applies the principle of “Gan”. Gan means “to stop” and is usually symbolized by the immovable mountain. We must go forward when it is required and stop when it is required, each at their appropriate instant. Moving and stopping should match with time in order to achieve. A mountain never moves. Man should learn the stability of the mountain, and not act in a hasty manner. Though fast actions seem fine, we should know where and when to stop. This pattern reflects the need to combine movement and non-movement in response to an attack. The stability of the mountain is defined as the structural soundness which results from having resolved one’s ambition to touch heaven in the limitation of excellent form. This resolution is of a noble and majestic character; thus, the image of the mountain. The tiger stance (beom-seogi), in which most of our weight is settled on the back leg, expresses this peculiar stability which also contains ambition and allows for freedom of movement. Pal Jang is a series of actions applying the “Gon” principle of Palgue. Gon symbolises ‘Earth‘. The Earth is that from which all life springs, matures, and dies. Things take life from gon; they grow from it, drawing limitless energy from it. Gon is defined as being completely receptive. Its metaphysic is pure yang. The earth is where the creative force of heaven and light (keon) is realised into physical form. The earth is always wordless; it hugs and grows everything. This pal jang is the gup-holder’s last round of training, and a steppingstone to the way of a dan-holder. Here you review fundamental actions and concepts found in the previous forms. This is the platform from which the more advanced patterns can be studied. 7.Kiai Learn to control breathing when yelling at set points in Poomse, do so in loud short bursts emanating from lower abdomen. 9.Kokyu Controlled and balanced breathing during the execution of Poomse. 13.Practice Poomse every day so consistency is learned. 14.Practice one Poomse at a time and become proficient in doing one prior to advancing to the next one. Taegeuk is the spirit of Tae Kwon Do. Each student must learn the idealisms of Taegeuk which are: Pacifism, Unity, Creative Spirit, Future Spirit and Eternity. rit of the sun and sky, while the female is the spirit of the moon and the earth. It is believed that the male and female are derived from Taegeuk. 1. The elements of metal, water, wood, fire and earth are believed to help each other to be produced; fire from wood, wood from water, water from metal, metal from earth, and earth from fire. 2. Fire melts metal, wood takes nourishment from the earth, water extinguishes fire, and metal cuts wood, and the earth blocks water. This is called the destructive theory. 3. The law of nature called “The Ying Yang Theory” which means “the negative and positive, and the male and female”. 4. The great absolute theory. 5. The “Ohaeng Theory”, the five primary elements. 6. 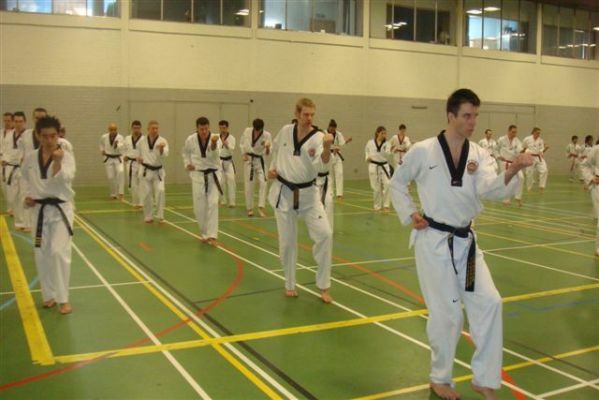 Taegeuk Poomse follows the aforementioned theories and integrates them into the methods of attack, defence, forward movements and retreat, control of the speed of movements, and the intensity of the actions.